Symposium speakers and program leaders. 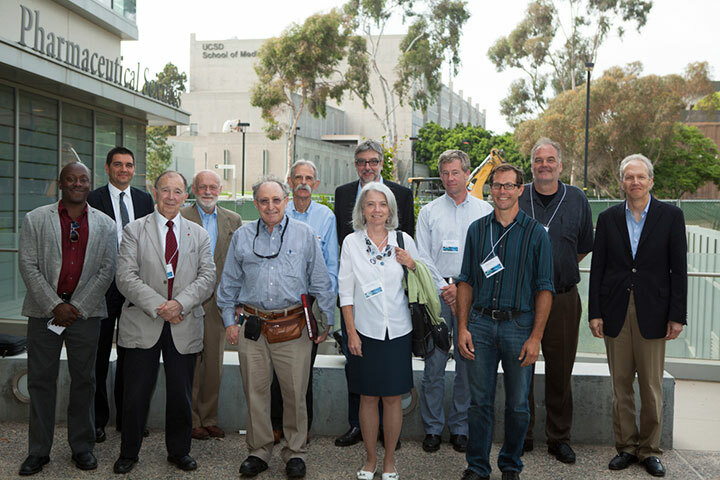 Back row (from left): Fabien Agenes (OST), Palmer Taylor (UCSD), Nicholas Spitzer (UCSD), Olaf Sporns (Indiana University), John Reynolds (Salk Institute), Anders Dale (UCSD), Ralph Greenspan (UCSD). Front row (from left): Todd Coleman (UCSD), Jean-Pierre Changeux (Pasteur Institute/UCSD), Mark Ellisman (UCSD), Terry Jernigan (UCSD), Jonathan Sebat (UCSD). Not pictured: Michael Roukes (Caltech). In a first-of-its-kind academic forum, an international audience of more than 60 distinguished scientists gathered at the University of California, San Diego to discuss the future of brain-mapping research and trans-Atlantic collaborations. 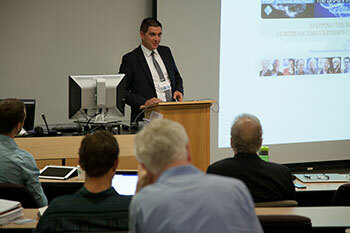 The “Mapping the Brain: European and U.S. Perspectives” symposium took place July 15 at the Skaggs School of Pharmacy and Pharmaceutical Sciences. It was sponsored by the Office for Science and Technology (OST), the scientific branch of the Embassy of France in the United States. The goal: to build bridges between Europe’s Human Brain Project (HBP) and the U.S. government-funded Brain Research through Advancing Innovative Neurotechnologies (BRAIN) Initiative. 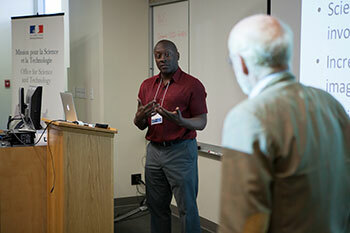 The Skaggs School and UC San Diego’s Kavli Institute for Brain and Mind co-organized the event. Fabien Agenes, the French Embassy’s scientific attaché for life sciences based at the Consulate General of France in Los Angeles, kicked off the full day of presentations by highlighting the ambitious European and U.S. brain-mapping programs. “The two initiatives share the common goal of achieving a more comprehensive understanding of the human brain for improved diagnosis and treatment of medical conditions afflicting the brain,” Agenes told the audience. The European and U.S. brain-mapping initiatives only kicked into high gear in early 2013. In January the European Commission announced plans to spend approximately one billion euros ($1.4 billion) over the next 10 years on the Human Brain Project. The BRAIN Initiative proposed by the Obama Administration in April – after a brief mention in the President’s State of the Union address in February – carries a price tag of $110 million in 2014 alone, with overall costs yet to be determined. The U.S. initiative’s first-year costs will be channeled through the National Institutes of Health (NIH), National Science Foundation (NSF), and Defense Advanced Research Projects Agency (DARPA). UC San Diego bioengineering professor Todd Coleman (left) and dean Palmer Taylor of the Skaggs School discuss potential breakthroughs in developing brain-machine interfaces. Symposium speakers from UC San Diego also included Jacobs School of Engineering bioengineering professor Todd Coleman (talking about in-situ imaging technology); Pediatric Imaging, Neurocognition, and Genetics (PING) co-leader Terry Jernigan (the brain’s developmental and behavioral mechanisms); CBAM’s and PING’s Anders Dale (developments in imaging); genomics researcher Jonathan Sebat (about brain development and gene expression); and neuroscientist/computational biologist, Mark Ellisman. 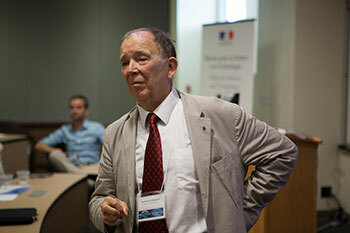 Professor Jean-Pierre Changeux, who is affiliated both with the UC San Diego School of Medicine and the Pasteur Institute in Paris, responding to questions from the audience. Other speakers included an expert on cognition, John Reynolds of the Salk Institute for Biological Studies; Olaf Sporns of Indiana University (computational technologies); and Caltech nanoengineering professor Michael Roukes (nanotechnology and collaborative research). Overlapping areas of interest to researchers on both sides of the Atlantic included the use of genetics to better understand the factors that drive developmental changes in autism, schizophrenia, and other brain disorders, as well as how wireless sensors and spatial arrays could be used to track body temperature and the electrical activities of the heart via novel, computer-brain interfaces. The final speaker of the day was Jean-Pierre Changeux, a pioneering French neuroscientist and emeritus professor at the Pasteur Institute in Paris, who is also an international faculty member of the Kavli Institute. It was Changeux’s involvement with UC San Diego and the researcher’s ongoing activities as an ethics leader in Europe’s Human Brain Project, that drove the French Embassy to propose the joint European-U.S. symposium, noted OST member Agenes. Changeux spoke about the importance of maintaining high ethical standards in brain-mapping research in both the HBP and the BRAIN Initiative. In discussing the ethical implications of such research, particularly with regard to genetics research related to brain disorders, Changeux asked the gathered scientists: “Should we inform the patient or the family of the patient of the results of genetic [testing] outcomes, or not? Should we make a distinction between the good genes and the bad genes?” He went on to ask whether ethics could permit genetic testing to be considered by researchers and individuals seeking to improve performance on academics or other metrics, or how brain-mapping data might potentially lead to workplace or educational discrimination “We will have to answer these questions,” he concluded.